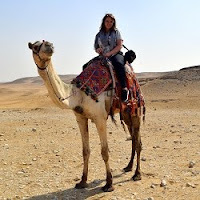 I’ve decided to include travelogues of our trips in my blog, primarily as an online scrapbook. Fair Warning - it’s long and probably only of interest to us and our moms. It’s the modern day version of having a dinner party and dragging out the slideshow of the family vacation... only without the cocktails. I encourage you to enjoy a glass of wine if you do decide to venture further. We headed to Paris on Saturday to celebrate our first anniversary and Matt’s birthday. We traveled by Eurostar which is the train that travels under the English Channel to France. It was a pretty freaky to think we were under so much water. Thankfully, within 20 minutes we were out of the tunnel, hardly enough time to work up a good panic attack. Quickly, we were traveling through the French Countryside. It was very comfy and took about two hours to get to Paris. We shared a sandwich and a glass of wine and enjoyed the views. We arrived to Paris about noon and took the Metro to St. Michael’s Station. We stepped out of the subway onto the street right by the St. Michael’s Monument Fountain. I had to stop and look around. I'm not too proud to admit that I had "a moment"… I'm in Paris!! 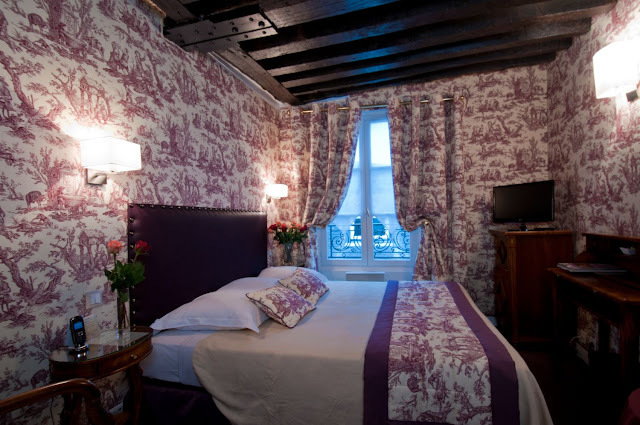 We stayed at the Relais Hotel du Vieux Paris. It is in the center of the Saint Germain district of Paris, on the left bank of the River Seine and close to the Notre Dame Cathedral. The location was perfect. It’s off a small alley in a walking district with many shops and cafes close by. Built in 1480, it’s very charming with exposed beam ceilings and fabric chintz wallpaper. The room was small but had a safe and a mini-bar. The staff was very friendly and helpful. Only problem, was that my hair straightener wouldn’t work even with a converter… looks like we going curly (frizzy) and up for the trip. There was a blow dryer in the room but not much power behind it. After checking in, we set off to explore. We stopped at a local café for a nice lunch and then walked to Notre Dame. It was free to enter and there was a line, but it moved quickly. The Cathedral is magnificent and we took tons of pictures. We then meandered back to the hotel and rested before dinner as we were both still feeling the effects of jet lag. For dinner, we took a recommendation from the desk attendant and walked to Le Christine. It was a nice restaurant, but unfortunately I made a poor menu choice. The mackerel was undercooked and had a metallic taste. The praline macarons made up for it. After a great night’s sleep, we headed to Versailles on Sunday morning via train. But, not before hot chocolate, baguettes and croissants at a cafe… the perfect breakfast. It was about a ½ hour trip to the outskirts of Paris. We toured the Palace for a few hours and stopped at the snack bar for lunch. The wine and passion fruit macaron were a treat and felt very French (although we both had a moment hoping they would have nachos). We took the trolley through the grounds to the Petit Trianon which is a small chateau on the estate. King Louis XVI gifted it to his 19 year old queen Marie Antoinette for her enjoyment. We decided that if we can ever afford our dream home it would have stone staircase and a 10 foot billiard table. The Versailles Estate is beautiful. There is a portion that is open as a public park. It was full of people enjoying the day outside, biking and walking dogs. There was a young girl learning to ride her bike. Can you imagine a life where you learn to ride your bike in the gardens of Versailles? It was a great day. For our celebration dinner that evening, we took a taxi to Robert et Louise. The restaurant was featured by Anthony Bourdain on No Reservations and lived up to expectations. Big, fresh cuts of meat cooked right in front of you on a wood-burning fireplace, served with salad and potatoes. The atmosphere was rustic and relaxed. We were seated at a shared table with an American family, an Aussie and his Irish girlfriend. We had a great time talking to them. The French bread and red wine were perfect and the steaks were amazing. We decided to stroll back to the hotel and stopped at a few cafes along the way for a Gin & Tonic. We walked past Notre Dame again. I just love the gargoyles and we were able to get some great night shots of the exterior. Monday we ventured out farther to check some more items off of our list. First order of business was crepes from a street vendor. We then visited the Eiffel Tower followed by the Arc de Triomphe. We strolled for a bit along the Champs-Elysees and stopped at a café for a refresher. The highlight was following a guy in an Einstein mask who was teasing and scaring people as they walked along minding their own business. The reactions were hysterical. Then back onto the Metro and to Montmarte. We stopped at an Italian Bistro for a late lunch of pizza and pasta. We took the funicular up to the top and toured the Sacre Couer Basilica. In the search of Vin Chaud (hot wine), we walked over to the artist’s square and were successful in our search. It was terrific. The views from here are fantastic! We headed home on Tuesday after one last stroll across the Pont Neuf and a café lunch. We both know a only a tiny bit of French, Matt more than I, but we had no trouble communicating. Almost everyone we encountered spoke English and they were very friendly. We would greet them with “Bonjour” and they would almost always respond with “Hello”. I’m not quite sure what gave us away, but they always quickly figured out we were English or American. And we thought we were doing so good. The trip was great. The weather was clear and chilly, but I only needed a heavy coat at night. We didn’t try to squeeze too much in since we wanted to relax and recover from a stressful few months. It was wonderful and I can’t wait to go back. Jessica has requested a Paris trip for her next birthday, we will have to see what we can do. Gonna go get my glass of wine (red) and check out your pics. PS. I am called Cindy Bee on my blog. Some friends started calling me that because I am a beekeeper. For real! Can you believe it? I saw your comment. I shoulda thought you would recognize Cindy Bindy, not Cindy Bee! Hey - that room looks more toille (might have spelled that wrong - us hoosiers would pronounce it twall) than chintz....just sayin. My brothеr recommended I might like this blog. Hе was entirely гight. Thiѕ post truly madе mу ԁay. Ӏt's an amazing post designed for all the internet people; they will obtain benefit from it I am sure.